There are two proponents in the argument about whether baptism is necessary for salvation. One camp argues that baptism is necessary for salvation and the other camp argues that it is not. Both camps have well thought out reasons for their positions. In my view, the most common objection to water baptism for the remission of sin seems to be the belief that baptism is a work of man... in other words... it is a human work and as such, can have nothing to do with salvation. This is a widely held belief in the evangelical world, so when the debate comes up... it is primarily to this objection the argument turns as a defense... baptism is a work. You hear this defensive position presented by preachers when they use the phrase, "We are saved by grace through faith plus nothing." This "Faith Alone" group has a strong opposition to anything which seems like a work and they feel like water baptism fits into that category because baptism is an act a person performs. Now, in responding to these assertions, I want to quickly review the things we discussed in our last lesson. Remember, we agreed, water baptism is a command of God and we concluded that baptism can not be both a work of man and a command of God at the same time. The two concepts are mutually exclusive. Commands are something we must obey, we have no choice in the matter. So, baptism is something we obey in response to a command. It is something we submit to and... in reality, it's not really something we do. It's something which is done "to" us, it's not something we do to ourselves or by ourselves. We must humbly accept the experience and allow ourselves to be baptized. We learn that baptism is a command in the Great Commission. Because the Great Commission tells us to baptize a disciple, we must conclude that baptism is a requirement for all disciples. Jesus told us to "Go make disciples and to baptize them." Now, if I am making disciples of Jesus, I have no choice but to baptize someone who wants to be a disciple of Christ. If that person will not allow me to complete the commands Jesus gave me, they reject Jesus plan for their life. Remember, Jesus also added, "Teach them to obey everything I have commanded you." They must obey what Jesus has commanded me to teach them! When we are disobedient to the command to be baptized, we are disobedient to Jesus. This is a serious issue. Disobedience to Christ surely has some impact on our relationship with Christ. If we won't have a Lord, we can't have a savior. The idea that "baptism is a work" is the foundation stone on which the entire Evangelical argument is built. So, let's discuss how people often come to the conclusion that baptism is a work of man. When someone tells me that baptism is a work, I've gotta ask them, "Who taught you that? Who taught you that water baptism is a work?" I can ask this question and, be pretty confident they might remember a specific person who told them that baptism is a human work. Let me explain why. I've studied the Bible with dozens of people including church leaders and elders who, when we arrive at the baptism issue in our discussions, they balk. They see clearly... from the scriptures... baptism universally precedes the forgiveness of sins. They struggle with this because, they believe they were saved, or their sins were forgiven at some point in time before they were baptized. They believe salvation happened when they accepted Christ. When they clearly see, from the scriptures, baptism associated with the forgiveness of sins and realize they have been wrong... and have been teaching other people the error, it's really disturbing. It's hard to accept! In an attempt to regain their footing, they meet quickly with their pastor and ask the question, "Is baptism necessary for salvation?" The pastor assures them that baptism is not necessary because it is a human work and the Bible teaches us that we are not saved by works. Instead of embracing those convicting feelings they experienced as they let the scriptures speak to their heart and taking the scriputres at face value, they look for reassurance from a person. They place human wisdom above the authority of the scripture and that person becomes their authority on the issue of baptism. I have watched this process occur many times. I know the pattern really well. So, that's why I ask, "Who taught you that?" Someone must have taught you this concept because water baptism is never even remotely associated with human works in the Bible. On the contrary, the Bible, consistently presents water baptism, as a command and a normal part of the conversion process. So, it's a good question, "Who taught you that?" Because you can not arrive at that conclusion on your own from the Bible. The idea that Baptism is a work is a super entrenched tradition of the denominational world. Now, as long as we are on the topic of works, there are other religious activities which could just as easily classify as works under this same definition. Remember, we have defined a work as an action we perform in order to be saved or receive the forgiveness of sins. How about repentance? Is repentance a work? Peter told us in Acts 3:19 that we had to repent before our sins were wiped out. What about confessing Jesus as Lord. Paul taught us in Romans 10:9 that we must confess with our mouth and that confession and belief come before salvation. Confession and repentance are both things I do. They are both actions I take. Why are these things not rejected as human works or works of merit and deemed unnecessary for salvation? Why the discrimination against baptism? How about prayer. Like repentance, prayer is obviously something we do. Is prayer a work? Salvation as a result of prayer is a well established practice in the Evangelical world. It even has a popular name, "The Sinner's Prayer." When preachers offer this prayer as way to be saved, it is often followed with a bold and confident statement like, "Now if you prayed that prayer, you have made Jesus your savior." Saying a prayer to be saved is not a Biblical method for salvation, but how many times do we hear preachers say..."All you need to do is say this prayer...."
They tell us to do something... to take an action... which isn't even in the Bible... in order to be saved. Why is prayer not seen as a work of man? Here's another common religious activity... something we do to be saved. This one will surprise you. Now, before you say, "Belief is not a work." You should know that Jesus himself defines belief as a work. Look at John 6:28-29. John 6:28-29 Then they asked him, "What must we do to do the works God requires?" Jesus answered, "The work of God is this: to believe in the one he has sent." All five of these religious activities are things we do. They are acts we perform, but they never get labeled as a human work. Only baptism gets that label. Isn't that curious? Maybe we've misunderstood something. Maybe we should clarify what we really mean by the word, "works." Jesus gave us a better understanding in John 6:28-29. Let's take a look at this again. This is really helpful. Jesus calls belief a work, but look what kind of work it is. It is a work of God, not of man. It's no different with any of the things we have been talking about. They are all works of God, not of man or works of merit. When we say we can not be saved by works, we are talking about works of merit or good deeds we think will earn us spiritual bonus points with God. We are not talking about commands God gives us which we have no choice but to obey. Let's never confuse works of merit with acts of obedience. Works of merit are works of man. Acts of obedience are works of God. Baptism is the final act of a condemned man. A man who has heard the gospel, accepted it, repented of his sins, confesses Jesus as his Lord and obeys Jesus command by laying down his old life in the watery grave of baptism, only to be raised to a new life by God's power, love and grace. It has nothing to do with the man's good deeds or merit. Baptism is that exact moment when and where we are Born Again. 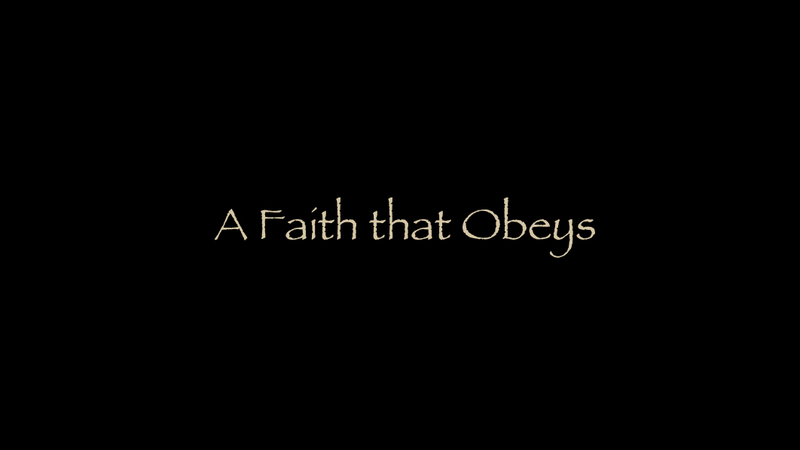 We must simply obey what Jesus asked us to do. We are saved when we obey the Gospel. Hopefully, we have laid to rest the objection, Baptism is a work. Baptism is a unique religious experience. Baptism is in obedience to Christ and if we are unwilling to obey Christ, on whatever issue, we have no hope of heaven. Baptism can not be both a command to obey and a work of man. On this fact alone, the entire argument that Baptism is not necessary for salvation should absolutely crumble. If we are unwilling to obey Jesus commands, how can we be saved? It just doesn't make sense. Remember, the issue is not baptism, it's obedience. You know, I think the main reason this erroneous line of thinking has become so ingrained in modern evangelicalism is because it is so deeply connected to the another grossly misunderstood teaching, the "Faith Alone" doctrine. Let's talk about that next.